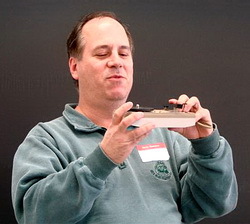 Mike, with his player during his January, 2009, presentation. The 1960s was a time of miniaturization and portability in the electronics field. Battery-operated transistor radios were very popular, so it made sense in 1967 that Philco-Ford should have introduced a new record format for the hip teenager. The slightly shy of 4" diameter records were made of very flexible pure vinyl (the same material as used on Evatone Sound sheets that were often given away free in magazines for promotional advertising). The discs rotated at 45 rpm, and had a "hit" recording on each side. A sealed colour picture sleeve (6 1/4" X 5" wide) was included with each record, which retailed initially for 69 cents (in a later effort to stimulate sales, the price was dropped to 39 cents). Mike’s Philco-Ford 'Hip Pocket' player. The records are the actual hit recordings of the day, in monaural. They were sold in Ford car dealerships as well as in five-and-dime stores. Arrangements were made with some mainstream labels, such as Atlantic, Mercury, Roulette, Bang and Atco, to license the recordings. A total of 41 discs was issued, along with 12 children’s records. Some of the artists included: Tommy James, Otis Redding, Neil Diamond, Sonny and Cher, The Doors, The McCoys, Chuck Berry, Bo Diddley, Wilson Pickett, The Isley Bros, and Van Morrison. Typically, the records were back-to-back hits which, it was hoped, would be seen as good value for 69 cents (which was at the time, approximately the cost of a conventional 7" single). Hip Pocket records were promoted with portability in mind. They would easily fit in your pocket and could be taken to a beach or party. The sleeve, however, contained a warning that they were designed to 'only be played on manual phonographs' (which usually meant portables). Since the majority of record players by this time were automatic changers, the grooves of Hip Pockets were too close to the spindle in order to be played in their entirety. It appears that this was one of their main downfalls, which resulted in their short two-year life span on the market (this coupled with the fact that portable 8-track and cassette players were starting to make their appearances). In addition to displaying some of these unique records, I brought to our meeting a record player that was designed by Philco-Ford specifically for this format. 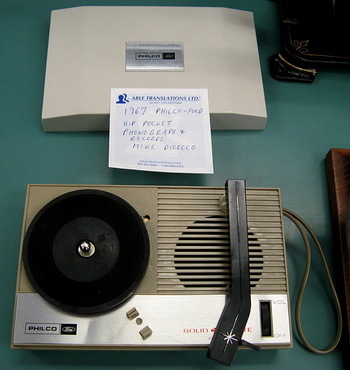 The unit measures 7" x 4 1/4", and plays only 45 rpm discs. While designed with Hip Pockets in mind, it will also play a conventional 7" single. The only control is both an on/off switch and volume control. The unit is operated by 4 "C" batteries, and has a 2 1/4" speaker. The tone arm, with crystal cartridge, is 4 1/2" in length. It is certainly an unusual sight to see a phonograph and miniature record that will fit in the palm of your hand! The combination is certainly the world’s smallest working record player, and is always a conversation piece, even to those who do not share our hobby. Today Hip Pocket records are seen as a fad by record collectors (that is, those who are even aware of their existence!). But they were an attempt to bring portability to an industry which today is dominated by even smaller MP3 players. Perhaps Philco-Ford was a little too ahead of the time!